The three regions of Tasman, Nelson, and Marlborough at the northern tip of New Zealand’s South Island are well known for their delicious wines. Don’t miss out on a tasty glass of Sauvignon Blanc to wash down your fresh seafood during your visit! The best way to get from the North to the South Island is via ferry from Wellington to Picton, which will take you through the beautiful Marlborough Sounds. These consist of a range of forested islands, with sheltered bays, sandy beaches, and untouched bushland. It’s also a great destination to spot dolphins, seals, blue penguins, and a whole host of birds. The Marlborough Sounds are located between the North and South Island of New Zealand. Don’t miss out on the opportunity to kayak, fish, cycle, and hike for example, along the challenging, 70-kilometer-long Queen Charlotte Track. The Nelson-Tasman region is known for being New Zealand’s sunniest region, making it popular among tourists and locals alike. Maybe it’s the warmth and sunshine that attract a huge range of artists to the area. The city of Nelson is particularly famous for its varied art scenes, with galleries featuring traditional, contemporary, and Maori pieces. Nelson is full of parks and gardens, sic as the Queens Garden. To soak up some sun, head to one of Nelson’s many parks and gardens, such as the Victorian-style Queens Gardens, or Boulder Bank, a 13-kilometer-long rocky stretch from Mackay Bluff to the Nelson Harbor. 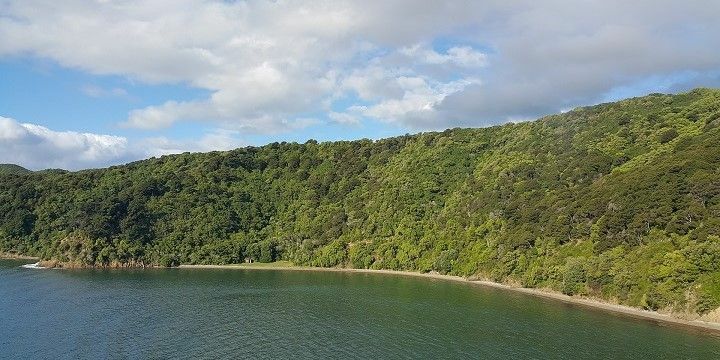 Alternatively, check out the beach suburb of Tahunanui, which lies about five kilometers outside of the city center, or visit the iconic Center of New Zealand, located on top of a city-center hill. Just 120 kilometers south of Nelson, you’ll find the Nelson Lakes National Park, which marks the starting point of New Zealand’s famous Southern Alps. 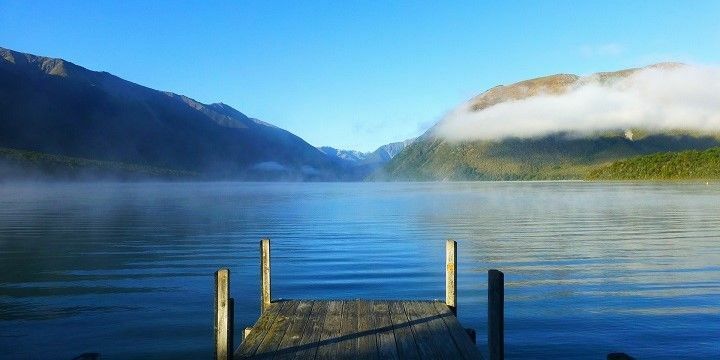 Stay in the picturesque village of Saint Arnaud, from where you can easily explore lush forests, glacial lakes, and steep peaks, or go fishing at either Lake Rotoroa, or Lake Rotoiti. The Rainbow Ski Field, which reaches heights of up to 1,760 meters, is open to skiers and snowboarders from July to October. Lake Rotoiti is one of the many glacier lakes in the region. Golden Bay, in the North of the island, is home to a whole host of natural wonders. Visit the Te Anaroa Caves, close to Collingwood, for an amazing underground collection of fossils and glowworms. Alternatively, head to Te Waikoropupu, close to Takaka, which has the clearest spring water in the world, and is a sacred place for the local Maoris. 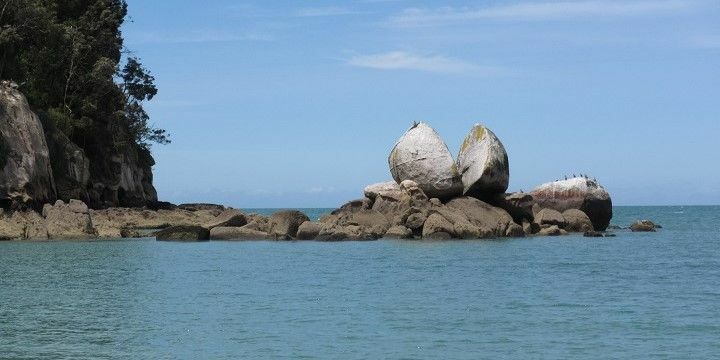 Split Apple Rock is a unique rock formation in the Abel Tasman National Park. Golden Bay is a great starting point for trips into the Kahurangi National Park and Abel Tasman National Park, New Zealand’s smallest national park. One of the best ways to explore the Abel Tasman National Park is via a kayak tour. Try to book a tour which takes you to Split Apple Rock, a unique rock formation between Kaiteriteri and Marahau. Alternatively, put on your hiking boots and head along the world-famous Abel Tasman Coast Track, which will take you between three and five days to complete. The track is one of New Zealand’s nine Great Walks, meaning it scores highly for accessibility and scenery. Kahurangi National Park, on the other hand, is New Zealand’s second-largest nature reserve. In addition to the huge variety of plant and animal species in the 4,520 square kilometer park, Kahurangi is also home to an extensive marble cave system and the starting point of another of the nine Great Walks, Heaphy Track. The full track takes between four and six days to complete, and will lead you along the coast and river valleys, and through subtropical rainforests. The West Coast boasts tons of natural beauty in its national parks, such as Kahurangi and Paparoa. You’ll also find two of the most accessible glaciers in the world, Fox Glacier and Franz Josef Glacier. The former is just a short distance from Lake Matheson, the country’s most reflective lake, which affords the perfect view of the Southern Alps. The neighboring region of Canterbury is most famous for the city of Christchurch, which still bears the scars of the 2011 earthquake. 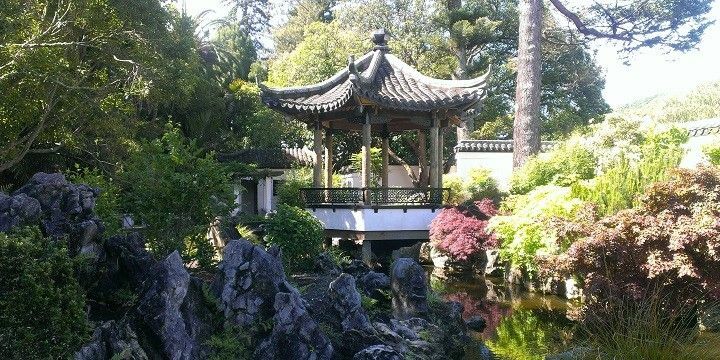 Those looking to relax will love the colorful Christchurch Botanic Garden, while travelers who want to soak up some culture can catch a show at the Isaac Theater Royal. Beach bums should take a day trip to the Sumner suburb or check out the Banks and Kaikoura peninsulas for fantastic whale and dolphin-watching tours. In the Mackenzie district, meanwhile, you’ll find New Zealand’s highest mountain, Mount Cook (3,724m), making the region perfect for hikers and skiers alike. Abel Tasman National Park was my favorite in New Zealand! I went hiking in the park and booked a kayak tour to Split Apple. You should be a nature and outdoor lover when coming here!